Watch a video clip about constellations, patterns of stars that have been given names. Watch a clip about the Milky Way, the galaxy where we live. A close-up look at the hot surface of the Sun, the closest star to Earth. Explore space with Paxi, a friendly alien, and see planets, moons and asteroids. Visit the Moon, Venus and Mars and find fun facts as you play a fun game. Watch astronauts board the Soyuz spacecraft and launch into space. Find out how an astronaut makes a sandwich in space. See where an astronaut sleeps on the International Space Station. Meet "SDO", a space telescope that takes pictures of the Sun. See pictures of stars, nebula, planets and galaxies taken by the Hubble Space Telescope. A beautifully illustrated, non-fiction picture book about space for very young children. Little astronauts can find out about planets, stars, asteroids, space travel, the International Space Station and lots more. With lots to spot and talk about, vivid illustrations and simple language, this is a fun and entertaining way to introduce little children to a fascinating subject. 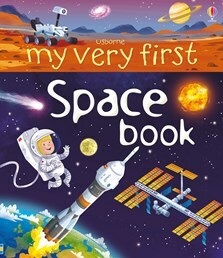 With links to carefully selected websites where children can find out more about constellations and space via the Usborne Quicklinks website. My 4 year old daughter loves this book. Beautiful pictures of galaxies, and entertaining pictures of what astronauts do. Lovely to have women astronauts depicted, thank you Usborne!